CANADA & ELSEWHERE: Due to the backlog with parcels through Canada post I can’t guarantee orders will be received by Christmas. However, if you live in Vancouver you may send me a message to pick up in person at my studio. 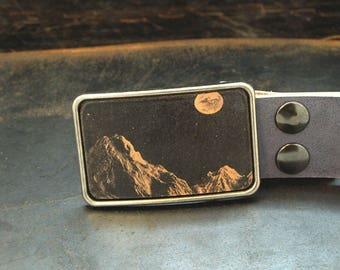 Handmade Belt buckles are our speciality and we have created a niche with our unique buckles. While we began with belt buckles, we are now expanding our line to leather belts, mason jar sleeves, earrings and keychains with a vintage graphic aesthetic. Our belt buckles and other leather accessories are made with a commitment to creating an alternative to mass produced products and supporting locally made economies. All our pieces are crafted with attention to detail, design and functionality. The belt buckles and other leather pieces in my shop are made lovingly from hand. I source out the best quality of materials to create my products. I have high expectations for my products and customer service and will ensure to the best of my abilities that you are happy with your purchase.I ship out my orders twice a week. If you need the package there by a particular date, please send me a message. New belt buckle designs are constantly being added, so please stop by frequently to see the latest! ©2008-2018 All content copyright flightpathdesigns. Photos & design may not be used without permission. Leather snap belt buckle belt. Custom cut. Hand dyed. Belt buckles. Antiqued finish belt buckle. Leather. Airplane. Mens nautical belt buckle. Ship. Vintage. Leather. Belts. Leather Belt Buckle Combo. Custom cut. Hand dyed. Belt buckle. Handmade leather. Green forest. Combo belt buckle belt. Custom Cut. Leather. Customize size. XS. XL. Hand dyed. Bike inspired belt buckle. Bicycle. Leather. Belt. Handmade. Couple. Valentine's gift. Floral bouquet keychain. Leather. Key fob. Handmade. Vintage ship buckle. Handmade belt. Leather. This belt is perfect! My husband was gifted a vintage belt buckle and I needed to find a belt for it. The fact that this just snapped on made it perfect. The belt is a nice quality and it shipped quickly. New banners are ready! Available in custom names for your little ones:) I'm partial to the goodnight moon. Hoping to get these listed online soon! Mason jar sleeve. Reuseable cup. Leather. Big trees. Redwoods. Forest. My name is Naomi Joy Yamamoto and I live on the beautiful West coast of Vancouver, BC, Canada. I attended the Alberta College of Art and Design where I completed a BFA. After finishing my degree I shared a studio with a friend. It was then that I realized I wanted to support myself primarily from my creative endeavors. Through a process of experimentation and fate, Flight Path Designs came to fruition. When I moved to Vancouver in 2008, the transition to a new city was refreshing and motivated me to take the plunge to become a full-time maker. I now have a studio in an old warehouse that was originally a mattress factory at the turn of the century. It’s inspiring to work in a building with such a long history of making. Pacific leather assists us in cutting the leather buckle inserts for our belt buckles. They are a local business that is family operated. They are also our go-to supplier for leather. The product line of Flight Path is hand-cut and hand-assembled at my studio in Vancouver, BC, Canada. At the heart of the biz is a philosophy which appreciates good design and a desire to provide handmade products of 'conscious consumption'. Flight Path can be found at stores throughout Canada. The Flight Path line has been featured in several publications, including The Globe and Mail, Orb Magazine, Swerve and Fashion Magazine. What drives my work is a desire to provide my customers with quality products which carry a history of handmade goodness. If you are unhappy for any reason with your purchase, please notify me as soon as possible through etsy's messaging system. I want my customers to feel happy about their purchases, so I am willing to do whatever I can to fulfill that. If you need to exchange or return the item, shipping costs, etsy and paypal fees are the responsibility of the buyer. All returned or exchanged items must be in their original form. Flight Path accepts paypal and other major credit cards. Payment is due upon clicking the 'buy now' button with online payments.Upon receiving payment, the product will be shipped within the week, depending upon stock and what day the order is placed.I normally go to the post office twice a week, however, if you need the package by a particular date, please say so during checkout. ATTENTION: I ship out my orders on Fridays and Wednesdays-twice a week. If you need your purchase by a specific date, please contact me to let me know. Upgraded priority shipping is available for an additional cost. I purchase insurance for all shipments and it is included in the cost. Shipments to the US and internationally from Canada may be subject to customs charges and is the responsibility of the buyer. For orders to most countries please allow 5 to 14 business days from shipping date to arrival. Please ensure that you have included the correct and full address to which you would like your purchase mailed to. Tracking is available within Canada, but is not included for other countries-if you would like tracking please let me know and I will figure out the adjusted cost. Should any item be lost or damaged via transit, please contact me and I will accommodate you to the best of my abilities. *NOTE: I cannot guarantee exact arrival times,due to the hectic and unpredictable nature of shipping. I ask that customers wait 30 days for their package to arrive before requesting a refund/replacement. Thank you for your understanding. Please contact me should you have any questions.Flight Path has a wholesale catalogue available. Please contact us directly with your store info and tax id #.